Postdocs at MSK work with multidisciplinary scientists in state-of-the-art laboratories. 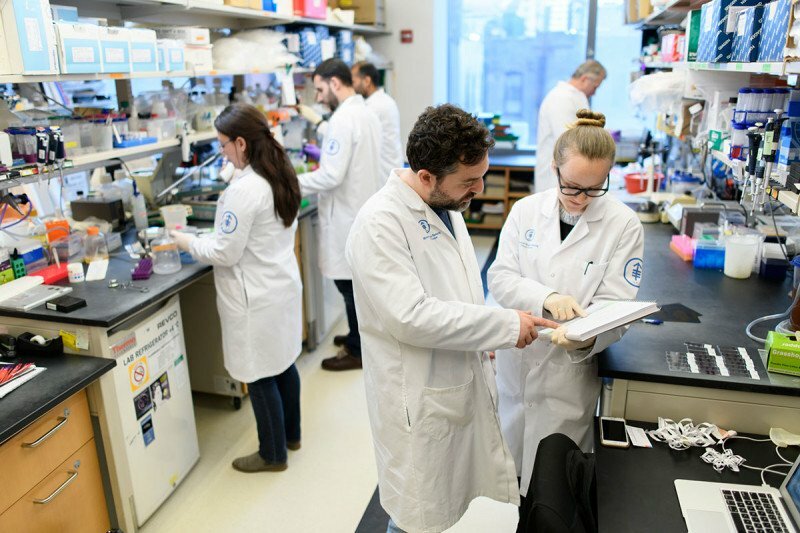 Memorial Sloan Kettering offers postdoctoral researchers a training environment that is rich in scientific resources as well as career-advancing support services. Our collaborative culture makes for an exciting and stimulating training experience where interdisciplinary teamwork and mentorship are strongly encouraged. The majority of our postdocs train in the 100-plus laboratories that make up the Sloan Kettering Institute. Renowned for its scientific excellence, SKI is the main division for laboratory research within MSK. A variety of exciting opportunities are also available in Memorial Hospital’s research laboratories, including the Human Oncology and Pathogenesis Program, which aims to bridge discoveries made in the laboratory with those made in the clinic. In addition to postdocs, our labs host more than 300 PhD students and more than 350 clinical trainees. A full calendar of scientific lectures, symposia, and special events helps to spark interaction among trainees, students, and faculty mentors. The vast resources of New York City can also add to the diverse opportunities open to postdocs during and after their training. MSK’s Office of Scientific Education and Training (OSET) provides an array of resources to help postdocs build skills and take charge of their careers. Postdocs can attend panel discussions and networking events or receive individual career counseling sessions tailored to their personal needs. And with more than 50 workshops and courses on offer throughout the year in areas such as computational biology, statistics, proteomics, and more, MSK postdocs have abundant opportunities to develop new skills and position themselves for a successful career.